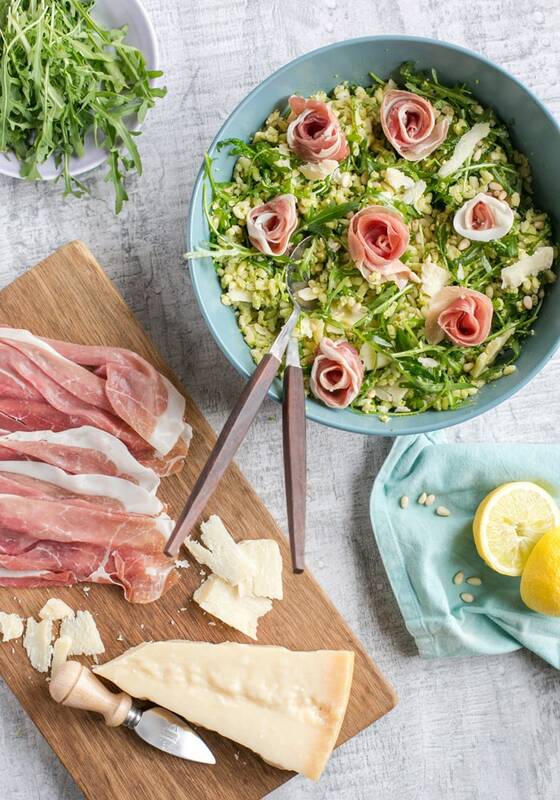 This Barley Pea Pesto Salad with Grana Padano and Prosciutto di San Daniele is always a crowd-pleaser – It’s wonderfully wholesome, and loaded with proteins as well as looking impressive and tasting superb. I love using pearl barley in my salads, it’s such a fabulous grain. Packed with tons of fiber, vitamins and minerals, barley may also help lower cholesterol and blood pressure. It’s also super cheap and keeps you full for longer. This Barley Pea Pesto Salad comes together in less than 30 minutes and only requires a bunch of ingredients: cooked pearl barley, homemade pea pesto, Grana Padano cheese and Prosciutto di San Daniele. I’m completely obsessed with pea pesto lately, it’s just so tasty and easy to make. It’s refreshing, with a sweet & tangy aroma, and it really takes only a food processor and 5 minutes to put together. 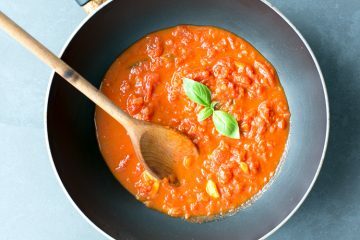 Being the proud Italian that I am, even though I go local as much as possible, there are few Italian ingredients I could never live without. 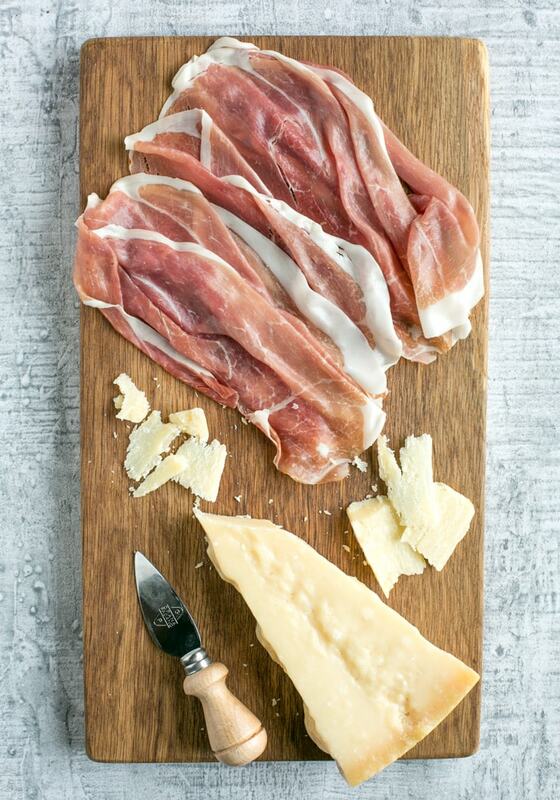 Grana Padano cheese and Prosciutto di San Daniele are definitely two of them. One of the key ingredients in Italian cuisine, Grana Padano has a bold but not over-powering taste, it’s umami-rich, loaded with proteins and complements any kind of meal. My favourite way to eat it is definitely shaved in refreshing salads such as this Barley with Pea Pesto Salad. 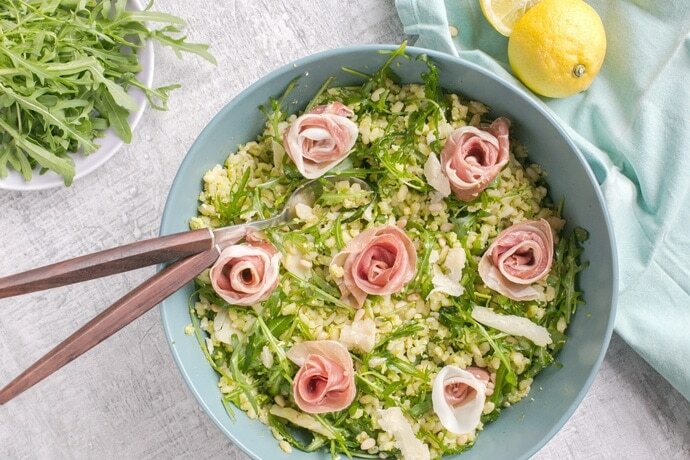 Prosciutto di San Daniele is a lovely addition to this vibrant barley salad, if you have tried it before, you know that it’s not like any other dry-cured ham. It has a distinctive salty, gamey taste and a uniquely sweet after-taste. Both Grana Padano and Prosciutto di San Daniele carry the PDO (Protected Designation of Origin ), which is a guarantee of origin, authenticity and quality of the best products in the European Union. To learn more about these two amazing products, visit the Prosciutto di San Daniele and Grana Padano sites. Back to this awesome Barley with Pea Pesto Salad, once you have all your ingredients at hand, all you have to do is mixing the barley with pea pesto, add in Grana Padano shavings and few slices of Prosciutto di San Daniele, and you’re good to go. Perfect for a light protein-packed lunch, picnic or easy fuss-free dinner, once you try this Pearl Barley with Pea Pesto Salad you’ll want to make it over and over again! 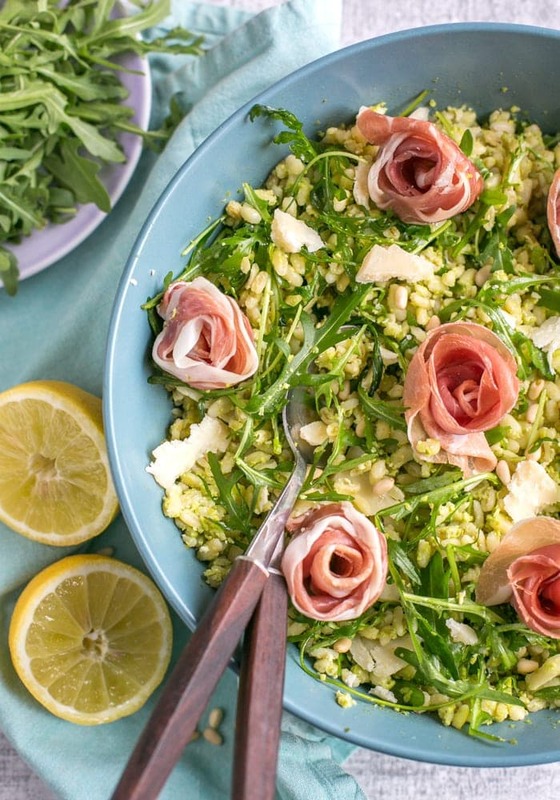 This Barley Pea Pesto Salad with Grana Padano and Prosciutto di San Daniele is always a crowd-pleaser – It's wholesome, loaded with veggies and makes a quick well-balanced meal the whole family will love. Boil the barley for about 15-20 mins in a pot of lightly salted water until tender, but still al dente. Transfer into a colander and cool under fresh running water, then drain well. In the meantime, prepare the pea pesto. 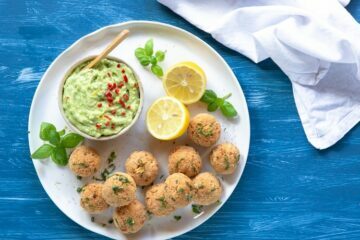 In a food processor add cooked peas, lemon juice, garlic, pine nuts, olive oil and a generous pinch of sea salt and black pepper. Blend until smooth for about 1 min, scraping down the edges with a spatula half-way through. In a large salad bowl mix together cooked pearl barley with ⅔ of the pesto (store the remaining pesto for another day). Add in rocket leaves and Grana Padano shavings and give it a nice mix. With the help of your hands roll each slice of Prosciutto di San Daniele into the shape of a rose, and place on top of the salad. Add some optional freshly cracked black pepper and serve immediately. Enjoy! The pea pesto ingredients are enough to make a big pot of pea pesto. You can add as much as you like to the salad and store the remaining pesto in the fridge for up to 4 days, or in the freezer for up to 2 months. Such a pretty salad, that pea pesto sounds amazing! I’m always game for recipes like this especially during the summer! 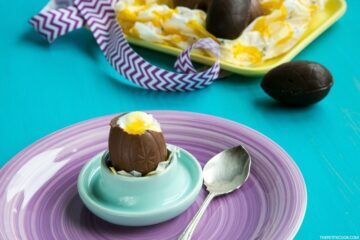 It’s packed with so many good ingredients and I can’t wait to make it for the husband! I’m sure he’ll love it! Those little prosciutto flowers are so cute! I’ve always wanted to make my own pesto but the pine nuts are so expensive, I end up buying pre-made pesto at Whole Foods! This looks good! I am going to try this sometime. I really need to try this Barley with Pea Pesto Salad recipe. Your pictures and the way you decorated the salad is perfect. This salad look beautiful. I love the rosette garnishes on it!! So pretty!!!! Never had or even heard of Pea Pesto!!!! But my goodness, it looks way too pretty to be eaten!!! I just may give this one a try! Pea pesto is something I’ve not had before. Love the sound of the ham, cheese and pea combo! That prosciutto I bet melts in your mouth perfect salad. Your pics are mouthwatering too. Now craving a good salada! This is so beautiful!I love the video. This would be a great dish for a party. What a delicious pesto! And that salad looks ah-mazingly delicious! I’ve truly never thought of using barley in a salad before! I love the nutritional benefits that barley offers but I mainly use it in soups. I have to say this salad looks fantastic and I’d love to give it a try. This sounds absolutely divine! I LOVE Grana Padano and prosciutto. 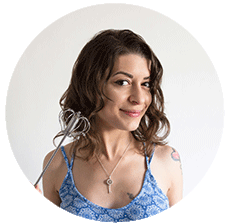 Can’t wait to try this recipe soon : ) I’ll make sure to to tag you on Instagram. Thanks for sharing Andrea! 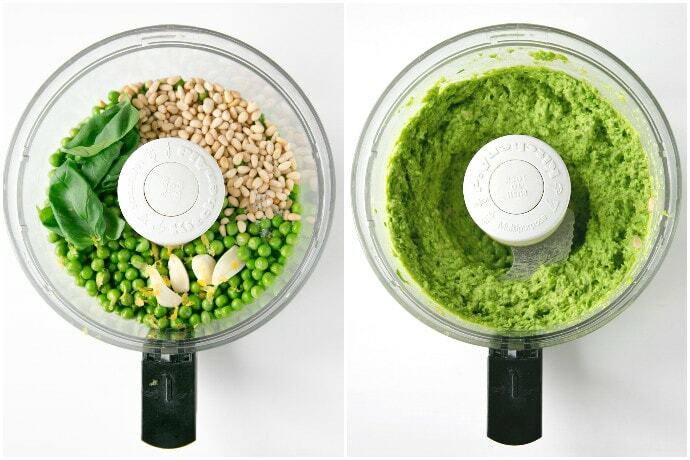 I’ve never had pea pesto but I am sure I will love it! Going to give this a try over the summer as I love Grana Padano and prosciutto. That sounds delicious! I’ve made rice pesto salad but haven’t tried with barley before, I do have a packet in the cupboard that needs using up however so I will have to give it a try!